In this session of the Council, 102 countries commented on the report provided by Iran’s representative on the regime’s human rights record and overall human rights situations under the Islamic state. The Council was split along the lines of repressive, undemocratic and/or opportunist regimes commending Iran’s ‘progress in human rights’, while western and democratic member states sharply criticizing the Islamic state’s brutal human rights record. For the record, the following countries, totalling 46, criticized Iran’s appalling human rights situation: Sweden, Switzerland, Spain, Macedonia, UK, US, Uruguay, Viet Nam, Argentina, Australia, Austria, Bahrain, Belgium, Canada, Chile, Costa Rica, Cyprus, Czech Republic, Denmark, Estonia, Ethiopia, Finland, France, Germany, Greece, Hungary, Iceland, Iceland, Ireland, Israel, Italy, Japan, Latvia, Lithuania, Luxembourg, Montenegro, Netherlands, New Zealand, Norway, Paraguay, Peru, Poland, Portugal, Romania, Sierra Leone, Slovakia, Slovenia. While the countries listed below – totalling 51 of which mostly are classified as unfree or partly free by Freedom House – either failed to criticize Iran’s record on human rights or commended Iran for ‘cooperation with UN mechanism’ and ‘progress on human rights’: Brazil, India, Niger, Palestine, Lebanon, Syria, Egypt, Thailand, Sri Lanka, Tunisia, Turkmenistan, Venezuela, Yemen, Zimbabwe, Afghanistan, Algeria, Angola, Bangladesh, Belarus, Benin, Bhutan, Bolivia, Bosnia and Herzegovina, Brunei Darussalam, Burkina Faso, Burundi, Chad, China, Cuba, North Korea, Djibouti, Eritrea, Ghana, Indonesia, Iraq, Kazakhstan, Kuwait, Lao, Lebanon, Mali, Mauritania, Myanmar, Nicaragua, Oman, Pakistan, Qatar, South Korea, Russia, Senegal, Singapore, Uzbekistan. Most of the countries applauding Iran’s repressive Islamic state on its human rights record, “welcomed the country’s participation”, “welcomed Iran’s efforts to promote and protect human rights” and were “encouraged by progress” made by the clerics in human rights and development. Some even applauded the ayatollas’ apparent ‘new charter of citizens rights,’ children’s rights legislation, new criminal procedural law, amendment to the penal code, and the newly established vice-presidency offices to deal with women, children and ethnic and religious minorities issues. Sudan “warmly welcomed” Iran’s human-rights progress in the face of international sanctions. Zimbabwe, another failed totalitarian state hailed Iran’s adoption of human-rights-friendly textbooks. Iran’s Human Rights chief filled his speech with self-righteousness, generalizations and justifications coming off as if there are no human rights problems in Iran…at all. “Mali has noted with interest the progress made in the economic and social spheres. This progress, we believe, is clearly the fruit of the measures undertaken by the IR to improve the living conditions of it population”, Mali’s delegation concluded. Unfortunately, for various commercial and political reasons, many of these countries blind themselves to the bitter human rights realities in Iran’s Islamic Republic. Such unashamed praise of regime’s human rights record comes on the heels of Dr. Ahmed Shaheed’s critical report on the situation of human rights in the Islamic Republic of Iran where “The human rights situation in the Islamic Republic of Iran remains of concern. Numerous issues flagged by the General Assembly, the United Nations human rights mechanisms and the Secretary-General persist, and in some cases appear to have worsened”. “Various laws, policies and institutional practices continue to undermine the conditions needed for the realization of the fundamental rights guaranteed by international and national law,” Dr. Shaheed’s report added report on the situation of human rights in the Islamic state in Iran. The Palestinian delegation, always critical of and outspoken against Israel’s treatment of Palestinians, only voiced its country’s concern on inadequate “health insurance” coverage to Iranian citizens, and avoided any reference to the gross human rights violation the population in Iran is subjugated to under the Islamist regime. It was expected that all the countries that praised the Islamic state for “the cooperation” with the Council and all the mechanism within the UN would fail to mention Iran’s refusal to allow the UN Special Rapporteur on the human rights situation in Iran, Dr. Ahmed Shaheed; however, it was surprising that aside from a few of countries (Slovenia included) who criticized Iran’s rights record, no specific recommendations were made to ask the Islamic state to open its doors on the Special Rapporteur. Since Reyhaneh Jabari’s execution occurred on the verge of this periodic review, many of the critical countries rightly highlighted the inequalities and injustice facing women in Iran. Many asked for a moratorium on executions in Iran with the view of abolishing the death penalty altogether, especially the execution of juveniles. Sweden, Australia, Austria, Bahrain, France, Hungary, Luxemburg, Netherlands, New Zealand, Slovakia and Mexico specifically criticized Iran’s Islamic state for the sharp increase in violation of ethnic and religious minorities’ rights and freedom, and recommended the country to take measures to promote, protect and respect their rights. Austria and France were the only two countries that mentioned the violated rights of Kurds and Arabs as an ethnic minority in Iran. Some other observations: Almost all the critical countries complained of Islamic Iran’s treatment of Baha’is and LGBT community in Iran. Other religious minorities under pressure in Iran such as Jews, Christians, Sunni Muslims, Yarsans and Gonabadi darwishi’s were not at all mentioned. High profile political leaders of the Green Movement under house arrest were not mentioned at all. The UPR human rights review is a mechanism involving the periodic review of the human rights records of all 193 UN member states. This was put into effect in 2008 in a cycle that lasted four years during which all the UN member states were reviewed. So far 98 states have been reviewed as part of the second cycle which began in 2012 and will continue until 2016. 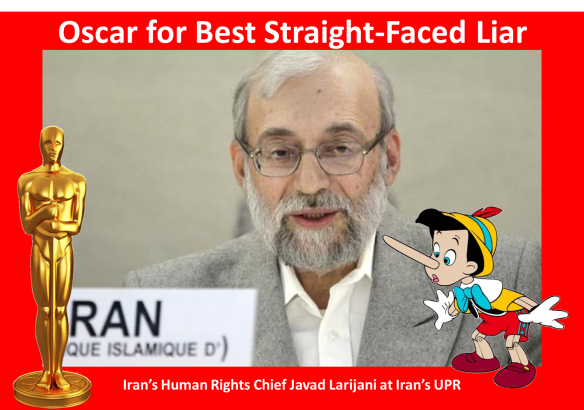 This is Islamic state of Iran’s second UPR review.